The risers, while a diverse group, all share a common characteristic; as a group, they began with comparatively strong Safety and Security scores, and they have improved these scores over the past decade. As a single country (based on an average across all 20 risers) they rank 67th in the world in Safety and Security, a big improvement from 83rd in 2008. They also share a second characteristic in common. Their Business Environment ranking rose more than any other pillar (as an average across the risers) up 12 places from 2008 to a rank of 83rd in 2018. This 10-year trend clearly shows that better Safety and Security enables improvements to the Business Environment, and in turn the other pillars follow with rising scores. This shows that a virtuous circle of rising prosperity can be achieved by building from a solid foundation of Safety and Security. Where citizens feel secure, countries prosper and rise steadily irrespective of where they started in the rankings. Safety and Security is a broader measure of human security and freedom than military capability and defence, although this can be important for ensuring security. It focuses on absence of violence and absence of fear of violence, in all their forms. The fact that Zimbabwe has risen the most after decades of hyperinflation and violent, political oppression shows that even the most fragile states are capable of positive reform and social progress such as improved judicial independence in Zimbabwe’s case. While backsliding on this progress is possible, we do see grounds for optimism and a fresh perspective on what drives prosperity. While most risers do not yet enjoy high levels of prosperity and half of the risers are ranked 90th or below, with a long way to catch up, they have all sustained a significant improvement in their prosperity over a 10-year period. India, for example, alongside extensive economic growth, has risen 11 places in the last decade from 103rd to 94th. Rising prosperity is achievable by almost any country when it achieves a degree of safety. It does not matter where a country is ranked now, rather its direction and speed of travel up the rankings are based on the reforms and choices made by its government, leaders and business entrepreneurs. The pathway to prosperity is about individuals and creating an environment where they can fulfil their potential and thrive. The risers have all improved in wealth and almost all improved wellbeing. People’s levels of satisfaction with freedom, healthcare and education, and their confidence in governments and elections have all registered some of the largest improvements, despite a global decline in these areas over the last decade. Each riser has had a different set of challenges to overcome, including civil war, political corruption, extreme poverty or a weak Business Environment. One of the highest ranked of our risers, Estonia experienced a sustained rise in prosperity over a period longer than a decade and has successfully managed to increase personal safety since the restoration of independence in the 1990s. The lowest, Togo, faced oppression and autocracy, which have been reduced but still are a major challenge under the president Faure Gnassingbé. They are also a regionally varied group, predominantly from the Asia-Pacific region. Five risers are from Eastern Europe and four from Sub-Saharan Africa. Aside from North America, MENA is the only region not represented. Despite these differences there are three drivers of positive changes in prosperity that are identifiable within this group. First, we have mentioned Safety and Security as a common trait among the risers and a foundation for prosperity. Ending war and conflict has proved to be the single most significant contribution to unlocking the prosperity of several rising countries. Tajikistan and Sri Lanka have ended decades of civil war, and nations such as Comoros have overcome secessionist conflicts. Bringing an end to conflict has enabled these countries to enjoy widespread improvements with almost all pillar scores improving over the last decade. Nepal in 2006 ended a decade long civil war, when a peace agreement was signed between Prime Minister Koirala and Maoist leader Prachanda. The peace agreement allowed rebels to join a transitional government. This is an achievement at a time when war, terrorism and deprivation are rising significantly around the world. The fact that 15 of 20 risers have improved in this pillar shows that insecurity from conflict and oppression can and must be overcome, before more broad-based prosperity can be achieved. Second, there were positive changes in the Business Environment and economy. Bangladesh is a success story among developing nations having risen 27 places in Economic Quality over the last decade. Now standing at 85th, it has increased its GDP per capita from $616 to $1,517 over the last decade. What is truly remarkable and laudable is that Bangladesh has managed to consistently reduce poverty, from 44.2% in 1991 to 14.8% in 2018, despite a series of external shocks including unprecedented flooding in areas of high population density after a major cyclone in 2007. 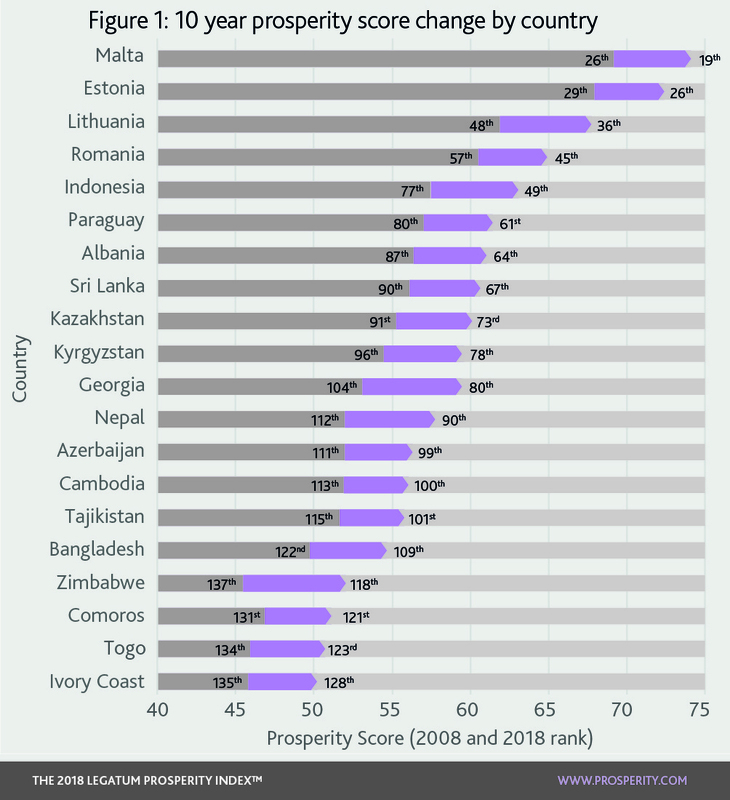 The nation, whilst ranked at 122nd in overall prosperity in 2008, stood at 57th in Safety and Security, with notably high levels of security of living conditions. Kazakhstan is another country that has made significant economic headway, doubling its GDP per capita since 2002. Paraguay has improved the levels of security of basic living conditions over the last decade and took 16% of its population out of relative poverty. While the country faces challenges of high crime rates, lower levels of inequality have ensured conditions conducive to real progress over the last decade. Third, rising prosperity is driven by strengthening governance. The Ivory Coast, for example, has experienced a long-term recovery from the political turmoil and widespread conflict that ended in 2011 and has seen an improvement of 43 places over the last decade in its Governance, now ranked at 103rd. This is remarkable improvement over a relatively short time period, given that it faced a major threat when an armed rebellion in 2002 split the nation in two. Similarly Indonesia, which became a democracy in 1998, has managed to maintain state institutions, allowing it to flourish in other areas, such as Business Environment, Personal Freedom and Education. Following the restoration of independence from the Soviet Union in 1992, Georgia was ravaged by civil war and secessionist conflicts. Yet, in spite of the 2008 Russian incursion, this Eastern European nation has managed to consistently increase its prosperity over the last 10 years, improving its score across all pillars and making it one of the leading risers in prosperity. The foundations of Georgia’s wide-ranging improvements in prosperity were set in place following the 2004 Rose Revolution by a team of reformers from the United National Movement (UNM) who came to power with a promise of radical change. Under the leadership of the former Minister of Justice, Mikheil Saakashvili, the product of an elite Soviet education and US law school, Georgia built a new government where many individuals spoke English and brought international experience of government and policy. This helped to create a strong, centralised state which became much more resistant to Russia and its external control of the country. The early reforms prioritised national security and a rebuilding of institutional foundations to overcome crime and corruption. The UNM adopted a zero-tolerance policy on crime from 2006 and this alone provided a huge boost to the security and governance of the country. The result was that Georgia’s greatest gains over the last decade have been in Governance and Safety and Security, rising 49 and 48 places to 56th and 68th respectively in 2018. Even after the UNM lost power in 2013 to the current government, Georgian Dream, trust in police remains high and crime rates continue to drop; the numbers of homicides per 100,000 people declined from 7.5 in 2010 to 2.7 this year. The governments that succeeded UNM, have continued the nation’s prosperity growth thanks to the continued strength of Safety and Security. The past decade has seen all institutional foundation scores improve in this Eastern European nation. The decision to prioritise security proved well founded for Georgia and provided the right foundations to enact successful reforms 10 years later across Business Environment and Governance. Despite being close to the bottom fifth in the Prosperity Index, Zimbabwe is a fragile riser in absolute prosperity over the last decade, rising 19 places from 137th in 2008 to 118th in this year’s rankings. The country’s history has been marred by economic crises, autocratic rule, political violence, the scourge of endemic disease, and systematic oppression of political dissidents by ZANU-PF militia. Despite this recent history, Zimbabwe’s relative development serves as a lesson that even the most fragile of states are capable of some positive reform and social progress. Zimbabwe was at the peak of hyperinflation and violent oppression during the 2008 election. However, the following years marked the first moderate improvements, with hyperinflation finally beginning to recede, life expectancy rising and the 2013 elections being significantly less violent. The constitutional term limit passed with an overwhelming majority, resulting in modest gains in political freedom and democracy level scores large enough by 2014 to drive Zimbabwe out of the bottom 10 for Governance for the first time in the Index’s history. In 2015 Freedom House improved Zimbabwe’s civil liberties score, following court rulings against ZANU-PF in several prominent cases, suggesting greater judicial independence (although the score dropped again as a result of last year’s coup). Judicial independence as reported by business executives in Zimbabwe has also been improving. Political pressure on teachers and restrictions on the operations of NGOs reduced in 2015, prompting an improvement in its political terror score, from 124th to 81st. Zimbabwe’s position is fragile. Poverty remains a major issue, with 21.4% of the population in absolute poverty (117th in the world) and 72.3% are in relative poverty (148th). This is despite relatively low unemployment and relatively high labour force participation. Maintaining stable governance will continue to be a challenge. The results of this year’s election were contested by the opposition and riots in the wake of polling killed three protestors.5 The country is now facing shortages of petrol, food and medicine. These crises stem from the long rule of Robert Mugabe, who was ousted from power in 2017. Without more extensive reforms, it is unclear whether Zimbabwe can continue to build its prosperity.